Drawn + Quarterly's third release in their ongoing John Stanley Library is a great achievement in archival comics presentation. 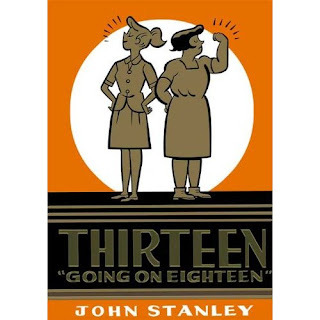 I've been awaiting this book, which reprints the first nine issues of Stanley's longest-lasting auteur comics series, Thirteen Going On Eighteen. 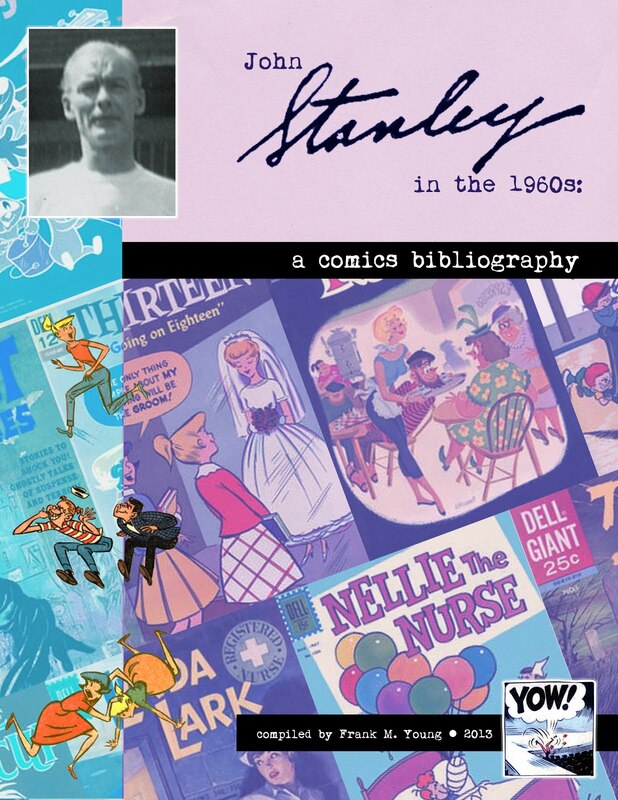 I somehow missed doing a review of the first volume of Stanley's Nancy comics, so I'll tuck some thoughts on that book into this piece. This 336-page full color book is a steal at $34.95. (The sticker on the back is mis-printed to say $24.95, BTW.) That its contents are of high quality, beautifully reproduced and rewarding to read is the proverbial icing-on-cake. It makes sense that D+Q chose this series as a follow-up to the Nancy book. Nancy was a breath of fresh air for John Stanley, after 15 years as writer and de facto cartoonist on the enormously popular Little Lulu series. Lulu's was a tightly defined, highly formal world for John Stanley. 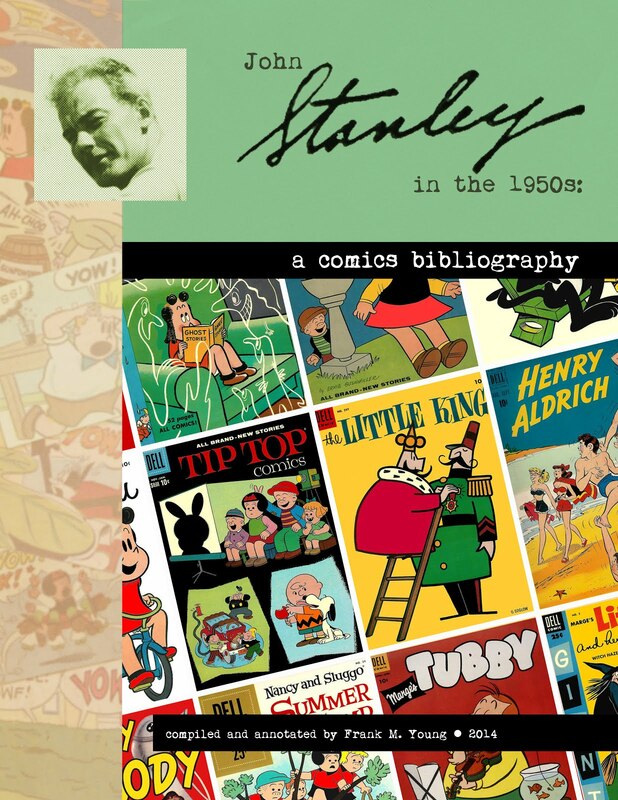 In writing its thousands of pages, Stanley created one of the most beloved and richly delineated comic book series. As Lulu became more popular, and more reliant on strict rules and formulas, it offered Stanley the creator less wiggle room to try out new approaches or ideas. One senses a sigh of relief as Stanley transitions from Lulu to Nancy. While their worlds are similar, Stanley's approach shifts dramatically after Lulu. He begins to take significant risks with the motivations and pre-occupational quirks of his characters. Less intent in its storytelling, Stanley's Nancy becomes an arcade of brassy situational humor, marked by a new, dispassionate attitude towards his characters. With Nancy, John Stanley develops a quality that, for wont of a better phrase, I'll call "loving contempt" for his comedic figures. Gone is the fatherly, nurturing, protective attitude he had developed towards the Little Lulu cast. Complex character motivations were rendered in broadest, boldest strokes. Stanley surrenders his characters to tragicomic fate. They run rampant through their own triumphs and failures, humiliate and avenge themselves, and hit higher highs and lower lows than before. The hands-on approach of Stanley's earlier comics becomes a void--a considerable distancing of creator and creations. He seems to say, to his characters, "Go ahead--do your best and your worst. I'm not going to control you anymore." This shift infuses Nancy with a bold, grotesque energy. 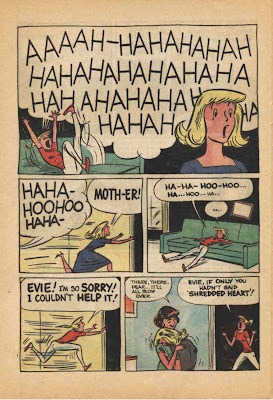 As Ernie Bushmiller's characters are ciphers--means to an end for a quick gag set-up--they were immediately more malleable and experiment-prone than the solidly delineated, deeply felt cast of Little Lulu. Nancy, good as it is, is merely a dress rehearsal for the most textured and novelistic writing of Stanley's entire comics career--Thirteen Going On Eighteen. Nancy is high-quality, absurd sitcom, on par with the best work of humorist Max Shulman. Thirteen is more akin to the works of Philip Roth, Bruce Jay Friedman or Joseph Heller. As the first nine issues of TGOE unfold, in this first volume, an intelligent, dispassionate yet deeply invested vision takes focus. Uncertain first moves flower into master-strokes of character motivation. Comedic stake-raising--always a Stanley asset--becomes more down-to-earth, more probable, and of bigger impact upon the lives of his fragile, risible, very real cast of characters. 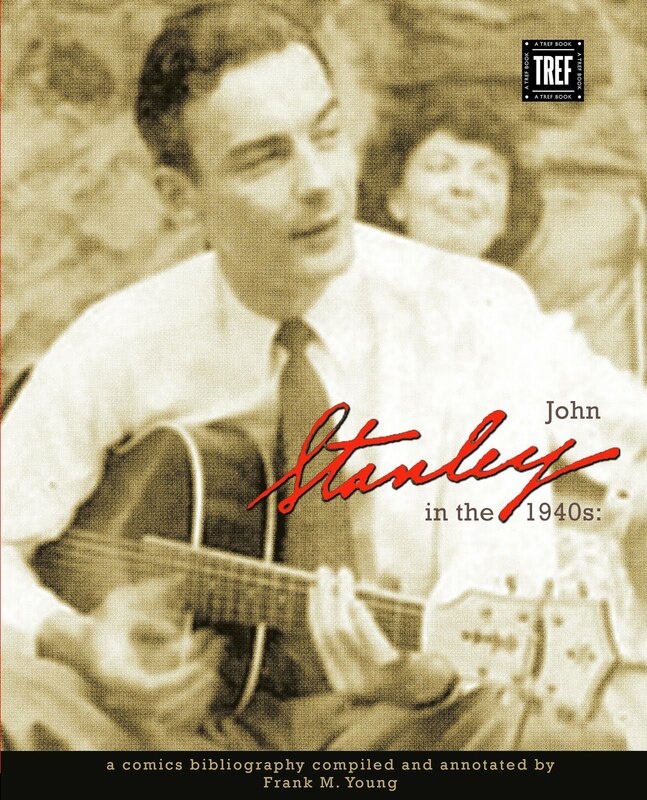 This book offers insight on John Stanley's creative process. A burst of half-formed new ideas slowly take shape; characters radically shift their appearance and attitude as their creator hones his first flush of inspiration to quiet perfection. The first two issues of TGOE were not drawn by Stanley. They were illustrated by one of the workhorse staff artists of the 1960s Dell Comics line, Tony Tallarico. Stanley's scripts inspire Tallarico to the best comic artwork of his checkered career. Tallarico manages to convey Stanley's absurdist humor fairly well, given that Stanley's ideas for this series were clearly still in a larval state. If the first two issues of the book look peculiar to modern readers, it cannot be denied that they are consistently funny and enjoyable. TGOE appeared quarterly. Stanley had the luxury of slowly and steadily developing and refining his ideas for the series. With the book's third issue, Stanley returned to publication as a writer/cartoonist--his first significant published comics work since the short run he did on Tubby in 1952/3. The concept for TGOE was ingenious and highly commercial. 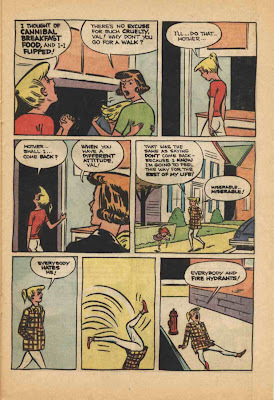 Perhaps the first comic book series to focus on "tweens"--kids neither tots nor teens--it was a clever middle-ground between the likes of Little Lulu and the ultra-popular Archie comics line. The potential for character-based humor is built into the series' basic concept. As it progresses, and Stanley becomes more sure of his characters--and of their potential for epic failures, humiliations, and the occasional triumph over fate--he makes them increasingly believable. 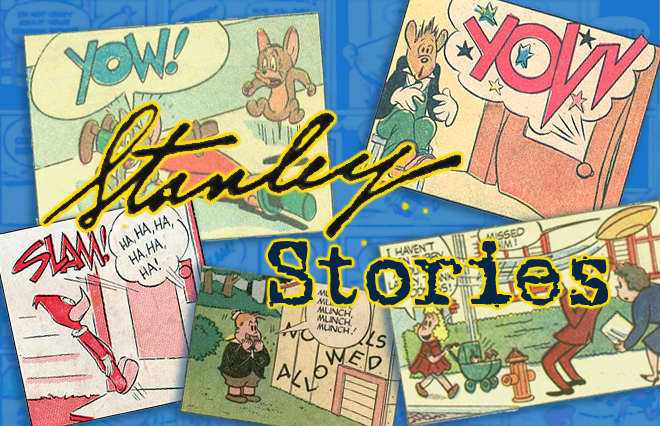 The characters of Nancy, Kookie, Dunc 'n' Loo and other Stanley comics are born of artifice and exaggeration. One cannot imagine inhabiting the same room with them. In contrast, Judy, Val, Billy, Paul and the other main figures of TGOE achieve a novelistic realness. They possess a sheer presence not seen in mainstream comic books, and seldom in newspaper comic strips. They are not puppets to be moved about stock situation-comedy scenarios. They are utterly distinguishable, as well. Val is her own person, as is Judy. Comedic secondary figures such as Charlie, Sticky Stu and Wilbur transcend their one-note gimmicks and become unexpectedly solid, compelling individuals as well. Stanley's achievement with TGOE is synchronous with the rise of the underground comix movement of the 1960s. The works of Robert Crumb, Justin Green, Gilbert Shelton and others have much in common with Stanley's final comics work. Despite their freedom to pursue frank, adult situations, language and behavior, the best of the undergrounds share with Stanley a desire to create comic book characters with more presence, probability and personality. Thus, as TGOE unfolds, and as Stanley develops the quirks and virtues of his characters, he creates a truly novelistic narrative. It is rich in small details, a believable everyday atmosphere, and a sense of the quiet despair of adolescent life. That this work is quite funny, while remaining true to a mature vision, is remarkable. Stanley is still as intent on amusing the reader. 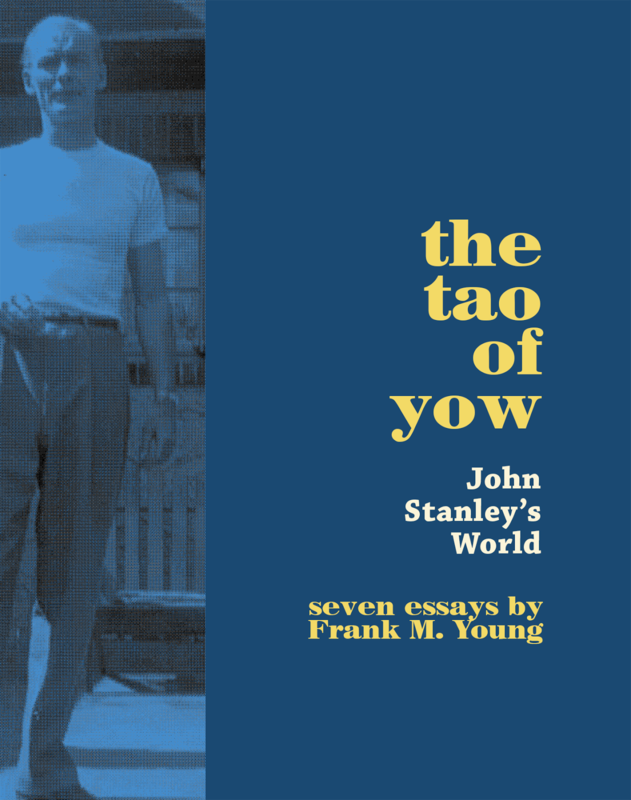 Stanleyisms teem on these pages--from the mantra-like appearances of "YOW!" to later developments in style, such as the increase (or decrease) of font size to connote changes in volume, and the assignment of Dickensian, usually satirical descriptive names for characters. A sub-feature in TGOE is the theater-of-cruelty, "Judy Junior." Stanley captures the inherent cruelty of childhood in a few swift strokes. I assume Judy Junior is the younger sister of TGOE's co-star. She is a horrific being, her sole motivation being the "guidance" of neighbor-kid Jimmy Fuzzi. They undergo the worst aspects of adult relationships, enacted in what feels, to me, like a brutal parody of Charles Schulz's Peanuts. (Imagine the Lucy/Linus relationship taken to its darkest extremes.) It is an absolutely caustic world that is equally funny and grim. "Judy Junior" orbits its own desolate tragicomic universe. Though it may have been created primarily to fulfill postal regulations, so that TGOE could be purchased by subscription, the feature leaves an unsettling taste in the reader's mouth. It is Stanley at his darkest and most unrelenting. Stanley's comic art strengthens admirably in the seven issues he illustrates in this volume. Tentative work gives way to elegant, simple drawings full of depth and personality. 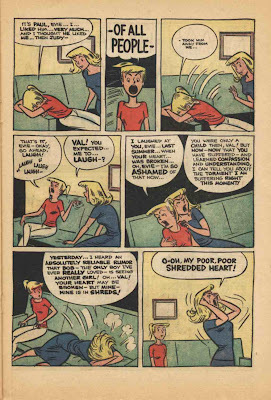 The cartooning improves once the book switches from more spacious, three-tier pages, to the four-tier set-up Stanley utilized in Lulu, Nancy and most of his post-1945 comics work. Stanley seems to thrive in the tighter, more cramped panels of the four-tier pages. His cartooning is sketchy but evocative, and is consistently impressive and expressive. The production of this book is a triumph for D + Q. After the murky reproductions of the first Nancy volume, with its distracting, incongruently bright yellows, the scans here are remarkably sharp, well-balanced and clean. It seems odd to me that, in the books' back-page biography of John Stanley, that it is never once mentioned that he is the cartoonist of this work. Perhaps it appears self-evident to D+Q's powers-that-be, but I feel this needs to be stated. People need to get that John Stanley was a skilled artist AND a great writer. Both sides of the art of John Stanley are in full display through this essential book. If you've been on the fence about buying previous volumes in the JSL, don't hesitate to purchase and read this one! Excellent review -- I will be posting one of my own soon at my blog "News and Views." I am not the Stanley expert you seem to be but have hugely enjoyed the LULU reprints from Dark Horse and the other D&Q volumes. The introductory essay by Seth in the THIRTEEN collection was especially welcome, providing as it did some needed perspective on how the title came to be and how Stanley approached its development. I'm thankful for your excellent review. As always, your insight in invaluable. I had a great conversation with the owner of my comic shop about the who was doing the artwork for these stories. I'm glad you can clear it up for us. As someone whose only prior reading of Stanley was his Lulu & Tubby works, these volumes are great. Of the three, I like Melvin the best so far. Its taking me a bit longer to get into liking Nancy & Thirteen. Nancy, in some ways, seems a pale version of Lulu. You have some of the same types of characters, but not as many. I would have like to have seen mention in the Nancy review of the mistake on the issues reprinted (we had discussed this via email) and Oona Goosepimple, who I think is the most interesting character in Nancy (I see her as a vehicle to bring in the whimsy of the 'witch hazel' stories of Lulu into Nancy). Also, because I was mistaken about the issues Stanley did of Nancy, I had figured there would be 5 Nancy volumes. Now I figure there will be 3, with 2 "Nancy & Sluggo" volumes (from that comic), unless I miss calculated there as well. Agree about the lack of covers in ALL these volumes. I think it a mistake. I always assumed Judy Junior was just Judy when she was younger (like Little Archie). "I always assumed Judy Junior was just Judy when she was younger (like Little Archie)." That's my take as well. Who would call a younger sister after an older sister?? Also, she goes thru the same changes in hair style as Judy thru the first 3 or so issues, which makes me think she's just Judy, but younger. I must save up for these volumes. I've kept the original comics we bought in the sixties, but my collection was hit-or-miss. It's nice to know that Stanley was the artist -- I sometimes wondered if he was, but then I also wondered if the Tallarico stories were by the same artist and that somebody'd simply realized that the earlier style was a dreadful mistake. At any rate, these are, to me, the real masterpieces of John Stanley. Which says an awful lot about how great they are. Really exciting that these comics are being remembered and revisited. They are the only comics that actually made me laugh out loud in the 60s.